Three of the most amazing marijuana strains (God Bud, Blueberry and Cheese) to ever be released are available as a single plant. 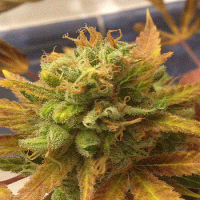 God’s Blue Cheese Feminized Cannabis Seeds by Jordan of the Islands Seeds: Three of the most amazing marijuana strains (God Bud, Blueberry and Cheese) to ever be released are available as a single plant. We’ve taken our recently released Blue Cheese and introduced it to our favorite God Bud male to create God’s Blue Cheese. These feminized marijuana seeds produce a yummy cheesy tasting cannabis strain with an impressive flowering time (avg 60 to 65 days). Anticipate an average size plant that produces dense, resinous colas. The marijuana plant may turn a vibrant, rich, purple hue and by dropping the temperature in the final 10 days of flowering you can achieve even more gorgeous results. Experienced growers will be able to bring out wonderful colors in GBC. 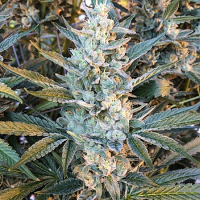 Jordan of the Island’s has the original God Bud genetics and we’re well known for our Blueberry lineage and we look forward to developing a strong reputation for our new feminized marijuana seeds with Gods Blue Cheese.